While I was in Arizona, Savannah and I tackled a few projects! Of course! It’s pretty much our favorite thing to do when we are together! That and going out for sushi 😉 One project we really wanted to get done was her youngest daughter’s bed. Her (almost) two year old little angel was done with her baby crib and needed a big girl bed! Savannah knew exactly what she wanted but she was a little nervous to tackle it herself. It was definitely a two person job but turned out to be a really fun project! First, we made a template of where we wanted the upholstery. We used butcher paper and taped it to the bed frame. Then we measured and marked where we wanted the tufts and buttons to be. Next, we drew straight lines from each point to get an idea of where the folds in the tufts would be. Next, we removed the template from the headboard and I traced and marked the foam while Savannah painted the headboard a gorgeous creamy white! Next, we re-taped the template to the bed, after the paint dried. Then, we drilled holes in the headboard using the template tuft markings as a guide. Then, we made 17 fabric covered buttons for the tufting. They were so stinkin’ cute! Totally worth the sore thumbs! 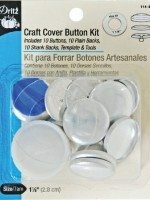 You can get these button kits at a fabric store. We got hers at JoAnn’s Fabrics. Next, the upholstering began! 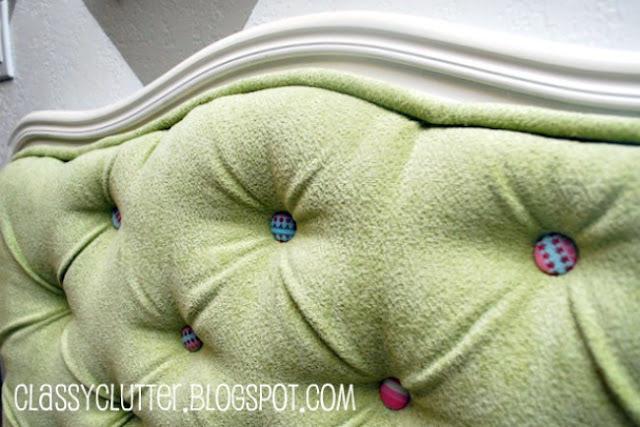 We used spray adhesive to attach the 2″ foam piece to the headboard. Then we stapled a large piece of batting over the foam. We used a staple gun for the upholstery. Then, we trimmed the excess batting and we used some clamps to hold the upholstery fabric in place so we could begin the tufting process. 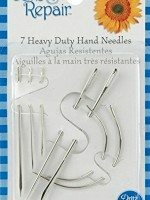 TIP: Do you tufting before you staple. 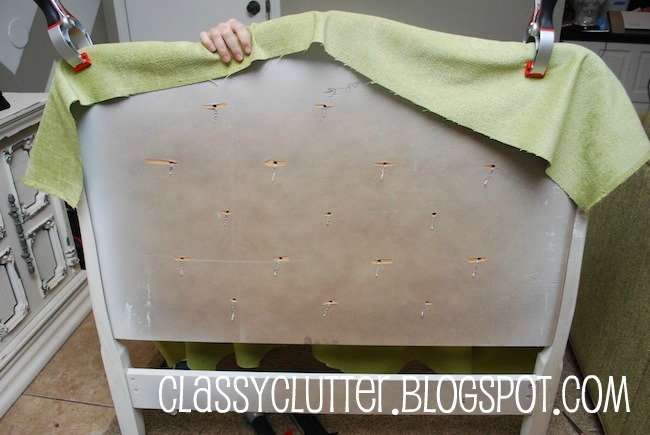 If you staple the fabric first, your tufting may look too tight. We wanted nice deep tufts so we did not want to pull the fabric tight until the very end! 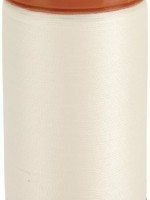 We used a long upholstery needle and upholstery thread. 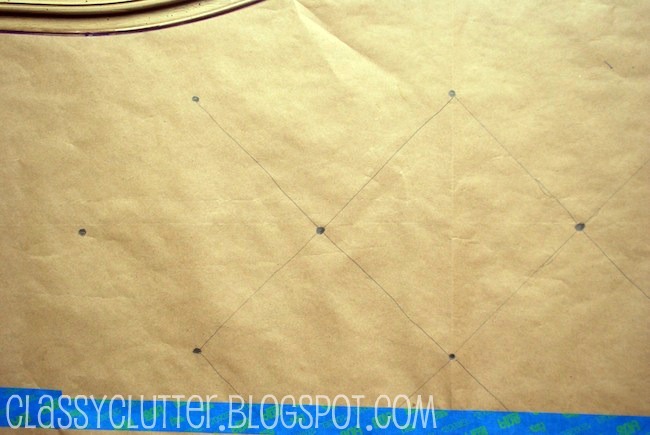 Start from the back fo the headboard and feed your needle through to the front, through the fabric. 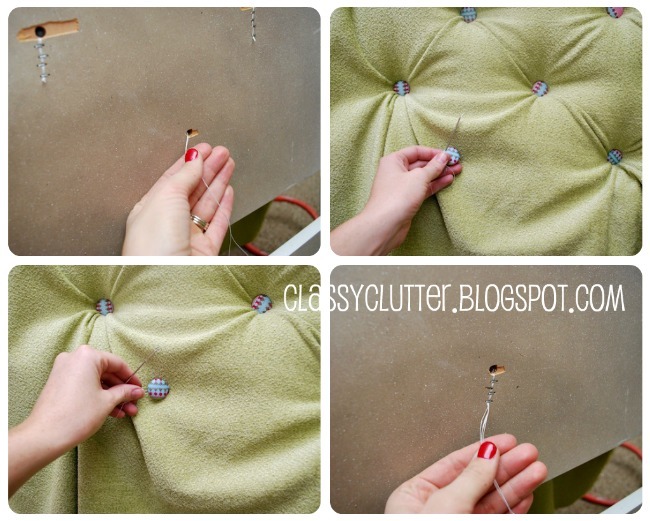 Attach the button and run the needle back through to the back of the headboard and staple the remaining thread securely to the back. Make sure to pull the needle really tight to get really deep tufts! The back should look like this when you’re done with this step. Next, we stapled the fabric to the headboard and trimmed the excess. Lookin’ good! But we’ve got one more important step! Piping! Finally, we started making our own piping so it would match the green fabric. 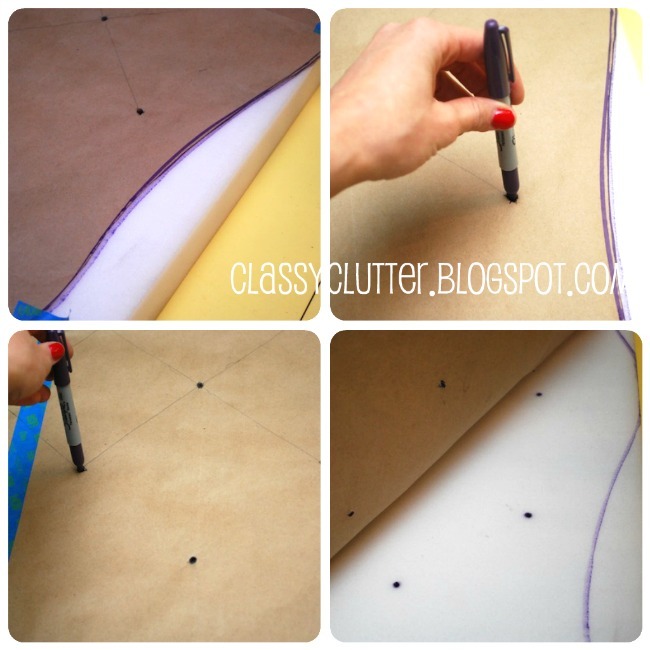 We already knew how to make piping but if you need help, here is a great tutorial. Click here. 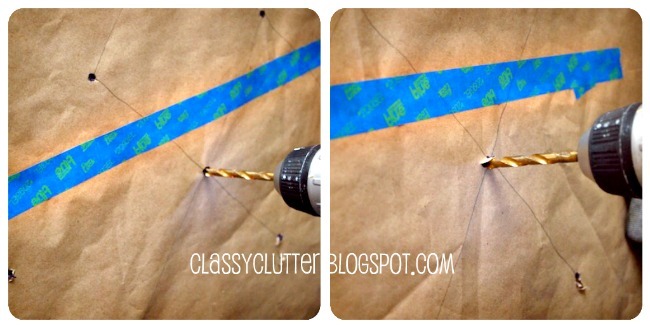 Then, hot glue your piping around the raw edges and TA-DA!!! DONE! We were so excited to tackle a project together since we haven’t been able to do that in about 6 months! BAH! Sad huh!? It couldn’t have turned out any better! We are a team and our team work always pays off! We both are in love with little Millie’s bed! Savannah is working her tail off to get the rest of Millie’s nursery turned into her big girl room! Savannah even sewed her little girl’s bedding using an unheard of technique! I’m so anxious for her to post it! Ya’ll are going to love it! She is also making some adorable pillows to match the buttons for Millie’s bed! Gorgeous! I love the colored buttons! One question? Could you have marked the tufting on the wood and then glued the foam and and drilled through the wood and foam at the same time? Just curious! thanks! This is wonderful. I just love it! It looks daunting. I am afraid to take on such a task, but you may have just inspired me! Great job! oh wow!!! What a great project with a beautiful end result! Such a fun, whimsical take on tufting. You girls did an AWESOME job! 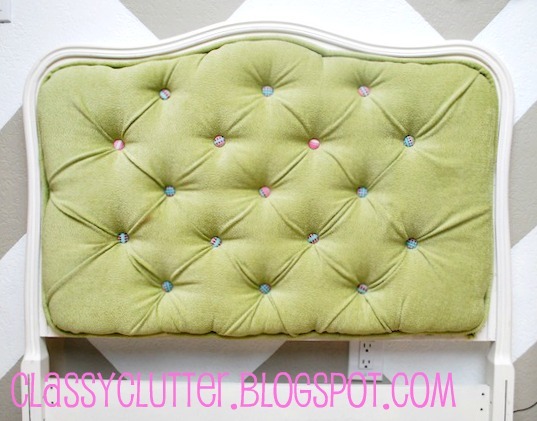 I tackled turning a coffee table into a tufted ottoman a while back and still love it! Would also love it if you stopped by for a visit! This is such a great whimsical headboard for a little girl! I made a tufted headboard but didn’t do the folds, and now I want to buy new fabric and “fix” it 😉 Great job! I love the whimsical look of the buttons. Nice job. Tufting is tricky. Girls! That is AMAZING!!! You have taken the fear out of tackling a project like this right out of me. Thanks for linking it up! This turned out beautifully! Love the fun color and the button fabric you chose. The tutorial is wonderful. I’d love for you to link this up to a party that I have going on at Project Queen. Great tut and beautiful job! 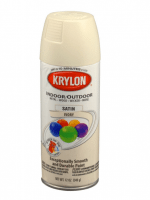 It will help make a gorgeous bed! God, I’m dying! That is so amazing. Found you over at Power of Paint Party. Awesome, awesome, awesome. This headboard turned out BEAUTIFUL! You did an awesome job with the tutorial too! That is adorably cute! I know both of my girls would still LOVE it & they’re 9 & 6… so you’ll get a lot of life out of it. I’m featuring it in the PoPP Spotlight this weekend. Thanks for linking up. Hi Mallory and Savannah, I’ll be featuring your amazing, fun headboard at Project Queen tomorrow night. Thank you so much for linking up and sharing! This is absolutely gorgeous! Great job!! 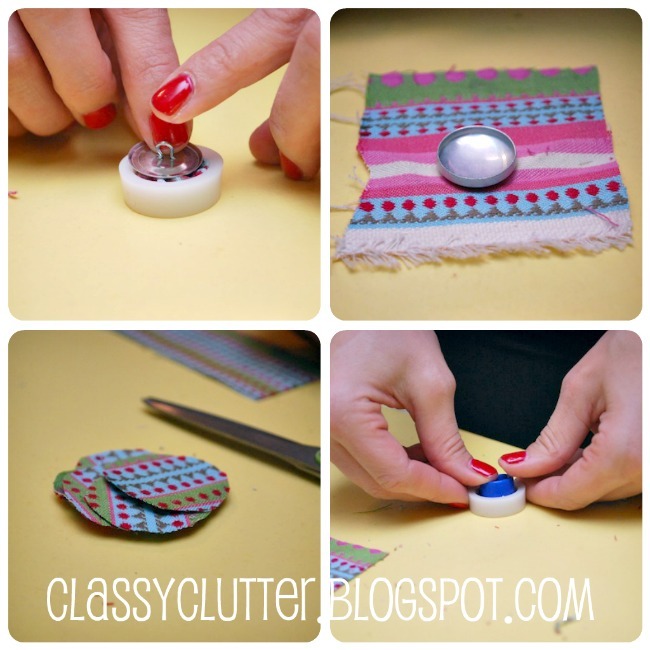 Stopping by from Remodelaholic’s linky party. I’d love for you to stop by and visit me! I love this! I have had this idea too, but haven’t found a headboard yet. I am so glad to see how it well it turned out. 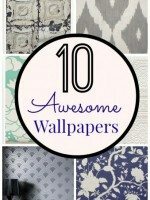 I love the fabric and colors you picked! Soo cute, great job! This project is fantastic, and the tutorial is very straight forward. I am dying to make one now. That is adorable! 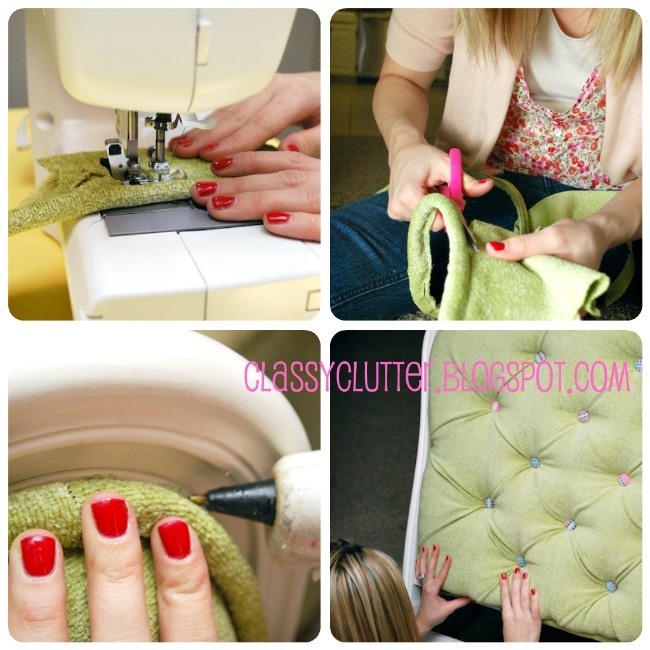 Thank you for the great tutorial – I think this would be perfect in my daughter’s room! I LOVE it. Great tutorial. Congrats on the feature at HoH! I’m happy to be your newest follower! Gorgeous! Came over from Tatertots and Jello! 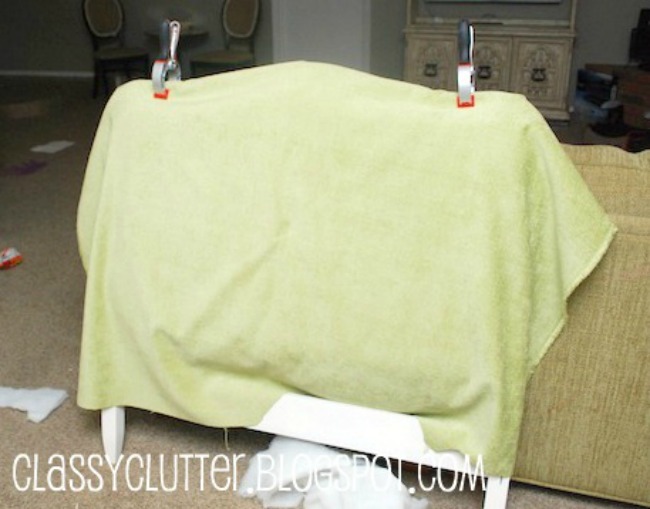 Your headboard is beautiful, nice job! 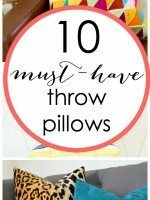 I have this linked to my headboards post as well today, for inspiration! wow.. I love how it turned out! You’ve motivated to make one too.. 😀 Thanks for linking up at friday fun party and welcome to the party 🙂 I hope you will come back too! Have a great weekend.. I was linking up to Tatertots & Jello party and your headboard caught my eye. I love it! I did the same thing to a headboard and I swear they could be twins. 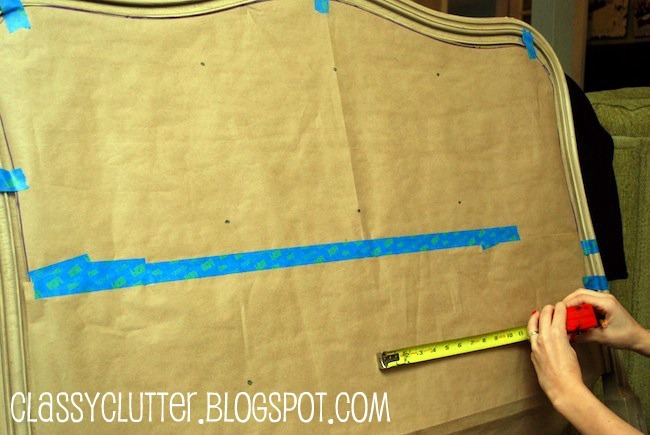 I have a pin board just for DIY headboards, going to pin yours to the list. The tutorial is fantastic! Great job girls. Amazing! I loooove tufting. Great job! 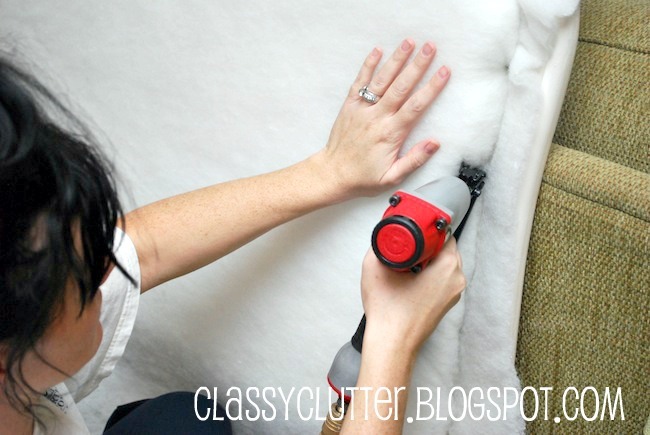 This is one of the most impressive tutorials I have seen on making a DIY tufted headboard! Your headboard is beautiful! 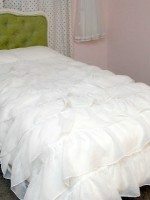 I have this in mind for our king bed – yikes!! Will pin this for future reference!! Thanks for the great tuturial! SOOOOO fun! i love this! the color, tufting, everything! 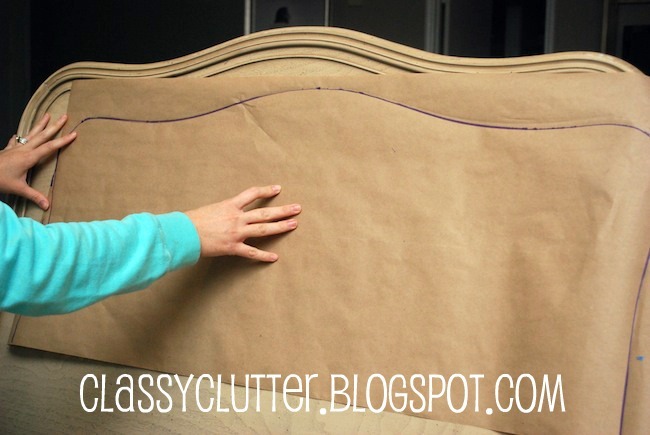 This tutorial was super helpful over the weekend, as I was working on my own tufted headboard. Love the color! Great tutorial!! Thanks for joining the party at Keep Calm and Link Up! Just wanted to let you know we’re featuring you today @ Keep Calm & Link Up and hope you’ll stop by to link up again (and grab a featured button)! Congrats!! Lucky girl! You all really outdid yourselves. This is beautiful! So cool! I’ve always wanted to attempt one but I still have to find a good place to put one! Wow, how beautiful! You did an amazing job on this headboard! Love it! This is so cute! You did so much work and it totally paid off!!! Great job! 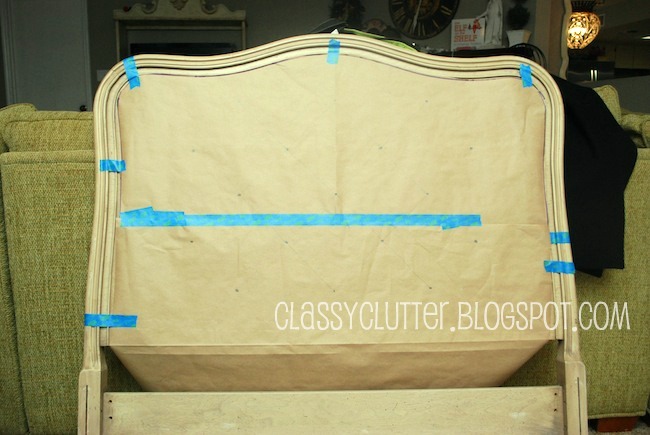 I’ve seen a lot of tutorials for tufted headboards around (hello, Pinterest!) but I think yours is the best, and clearest, I’ve seen this far. Thank you for sharing it!! I love what you did with the headboard. It’s beautiful. I have a link party called Wednesdays Adorned From Above Blog Hop and would love to have you share this with everyone. It runs from Wednesday through midnight Sunday. Here is the link to the party. 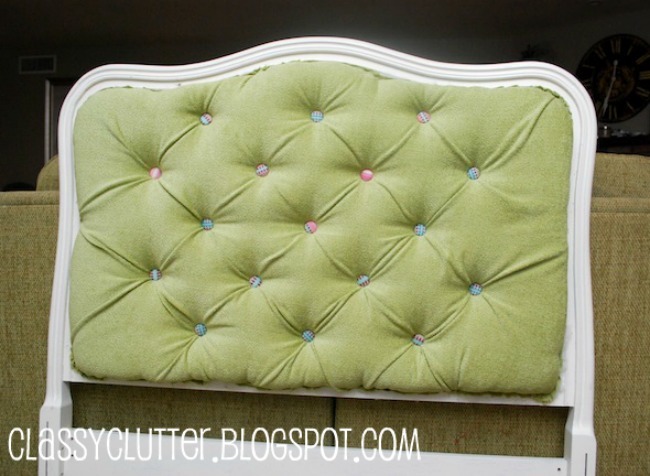 I love this tufted headboard that you made. I would like to discuss with you the possibility of featuring it in an upcoming issue of my magazine. We just sent you an email. Thanks so much! Thank you for sharing the step by-step process of your project. It looks beautiful and I love the elegance of it.